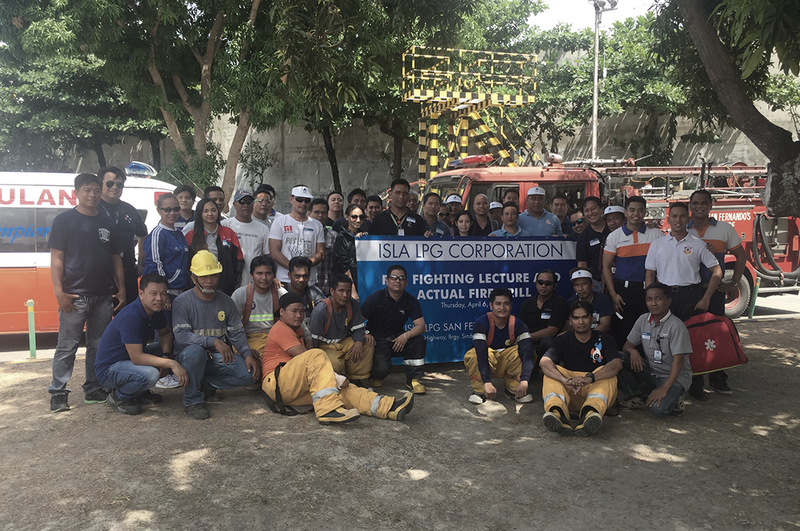 Five-day Fire Fighting Training Program raises awareness — Citadel Pacific Ltd.
Over a hundred participants took part of the five-day Fire Fighting Training Program initiated by ISLA LPG Corporation (ILC) for its Bulk and Commercial customers. The activity was spearheaded by ILC Plant Operations Executives Johmark Pallugna in San Fernando, and Regie Reyes in Canlubang, Laguna with further leadership and support from the company’s account managers. Held at ILC’s LPG plants in San Fernando and Canlubang, the event aimed to educate customers on fire prevention, fire extinguisher use and handling, and LPG storage and handling. Prevention and management of fire-related activities were thoroughly discussed. In addition, fire drills supervised by the Bureau of Fire Protection (BFP) were facilitated to put the fire protection team’s knowledge to test and scrutiny. The program and trainings form part of ILC’s commitment to safety as its main brand Solane continues to promote this value across its operations. It believes in the importance of prevention where such can be achieved with the right tools and knowledge. Actively participating were representatives from Solane’s valued B2B customers comprising safety officers and inspectors, pollution control supervisors, engineering supervisors, plant engineers, and plant operators.